In response to my post on the Moby Books Illustrated Classic Editions, one of our faithful readers…ok, my brother, asked what the difference was between the abridged version of a Moby Books edition (MB) and the original version. 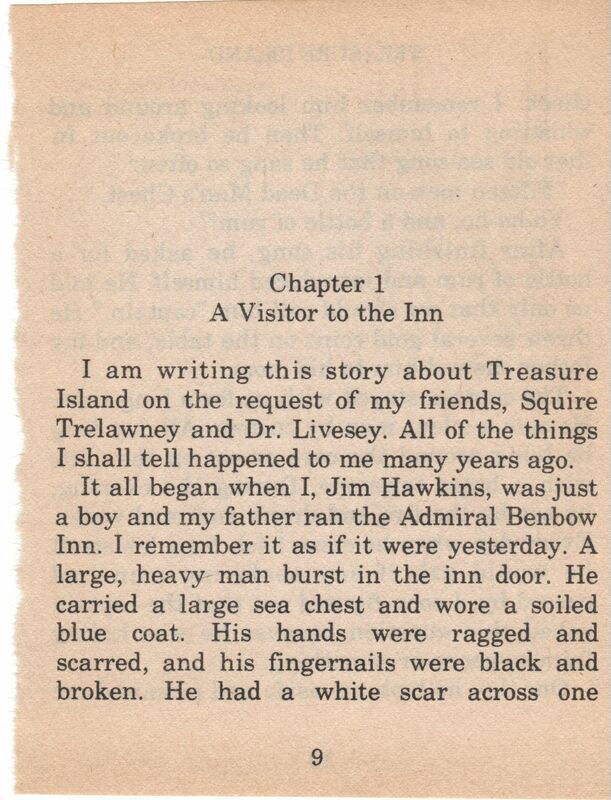 I thought I would provide a sample of the first chapter from the MB edition of Robert Louis Stevenson’s Treasure Island in contrast to Stevenson’s original text. “Well, then,” said he, “this is the berth for me. Here you, matey,” he cried to the man who trundled the barrow; “bring up alongside and help up my chest. I’ll stay here a bit,” he continued. “I’m a plain man; rum and bacon and eggs is what I want, and that head up there for to watch ships off. What you mought call me? You mought call me captain. Oh, I see what you’re at– there”; and he threw down three or four gold pieces on the threshold. “You can tell me when I’ve worked through that,” says he, looking as fierce as a commander. But though I was so terrified by the idea of the seafaring man with one leg, I was far less afraid of the captain himself than anybody else who knew him. There were nights when he took a deal more rum and water than his head would carry; and then he would sometimes sit and sing his wicked, old, wild sea-songs, minding nobody; but sometimes he would call for glasses round and force all the trembling company to listen to his stories or bear a chorus to his singing. Often I have heard the house shaking with “Yo-ho-ho, and a bottle of rum,” all the neighbours joining in for dear life, with the fear of death upon them, and each singing louder than the other to avoid remark. For in these fits he was the most overriding companion ever known; he would slap his hand on the table for silence all round; he would fly up in a passion of anger at a question, or sometimes because none was put, and so he judged the company was not following his story. Nor would he allow anyone to leave the inn till he had drunk himself sleepy and reeled off to bed. His stories were what frightened people worst of all. 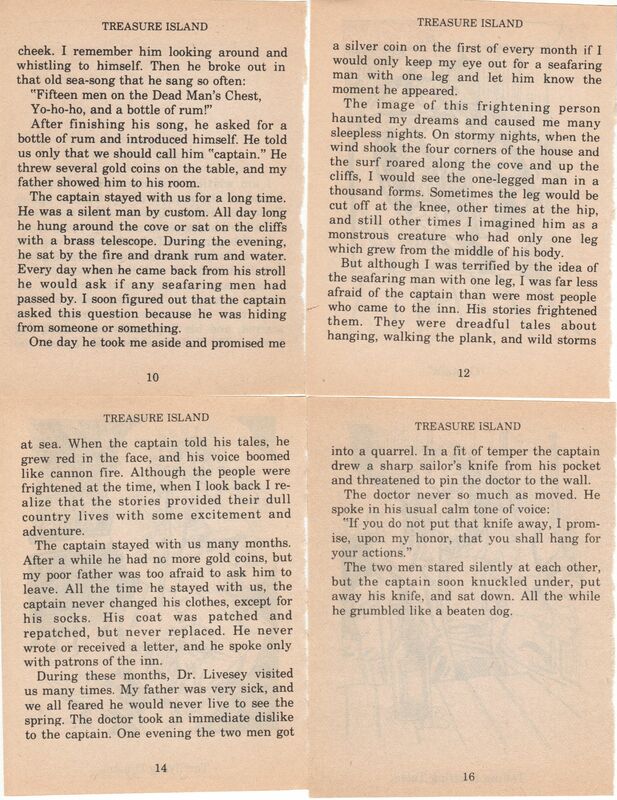 Dreadful stories they were–about hanging, and walking the plank, and storms at sea, and the Dry Tortugas, and wild deeds and places on the Spanish Main. By his own account he must have lived his life among some of the wickedest men that God ever allowed upon the sea, and the language in which he told these stories shocked our plain country people almost as much as the crimes that he described. My father was always saying the inn would be ruined, for people would soon cease coming there to be tyrannized over and put down, and sent shivering to their beds; but I really believe his presence did us good. People were frightened at the time, but on looking back they rather liked it; it was a fine excitement in a quiet country life, and there was even a party of the younger men who pretended to admire him, calling him a “true sea-dog” and a “real old salt” and such like names, and saying there was the sort of man that made England terrible at sea. The old fellow’s fury was awful. He sprang to his feet, drew and opened a sailor’s clasp-knife, and balancing it open on the palm of his hand, threatened to pin the doctor to the wall. Soon after, Dr. Livesey’s horse came to the door and he rode away, but the captain held his peace that evening, and for many evenings to come.